Wishing all bloggers a Happy Dussera, end of Navratras & Dandiya Ras. Hope you all had wonderful celebrations yesterday. I made the Dussera special meal along with matar pulao, aloo phool gobi & kheer. These recipes for some later posts. Today being the 7th of month, it’s time for some Sweet Punch. I usually plan & make my posts much in advance & never wait for the last day, however last 15 days saw too much baking & sweet in the household with Eggless BFC, Eggless Checkerboard Cake & Cream Cheese Cupcakes, so I kept postponing this recipe till the last day almost! 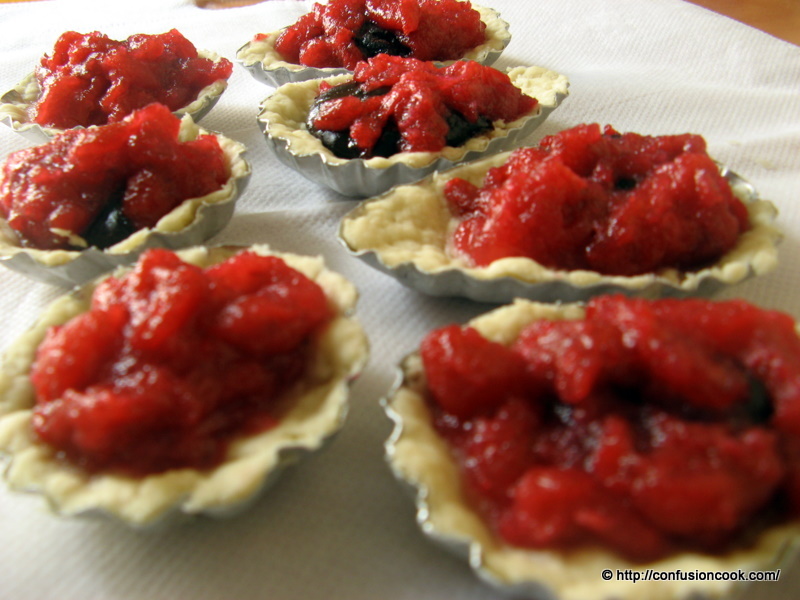 Upon researching I realized that the most essential part of tarts is to ensure that butter is chilled. I guess this is as easy as baking can get. Though Ria had chosen Jam Tarts, I had just too much tid-bits leftover from all the above experiments, I decided to use them & finish. For a change this is a recipe in which I didn’t need to worry about assembling lot of ingredients or replacing egg! Thankfully the crust of the tart is eggless, phew!!! I used a melon scooper to make chocolate truffles from leftover chilled ganache & quickly rolled them in cocoa. 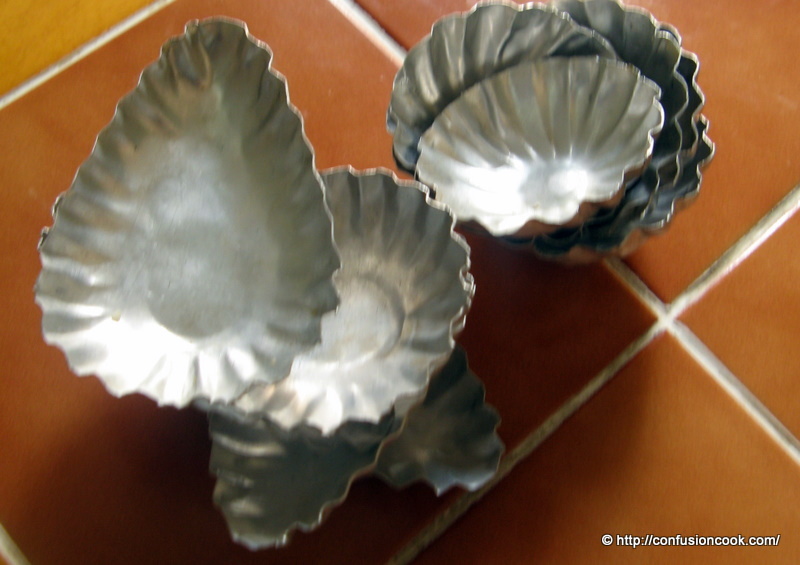 I placed them in an airtight container on a parchment sheet & refrigerated till further use. Pre-heat the oven at 180 C. Lightly grease the tart moulds. Mix flour & baking powder together. Add the butter & rub the flour & butter together using fingertips to create a dough resembling breadcrumbs. 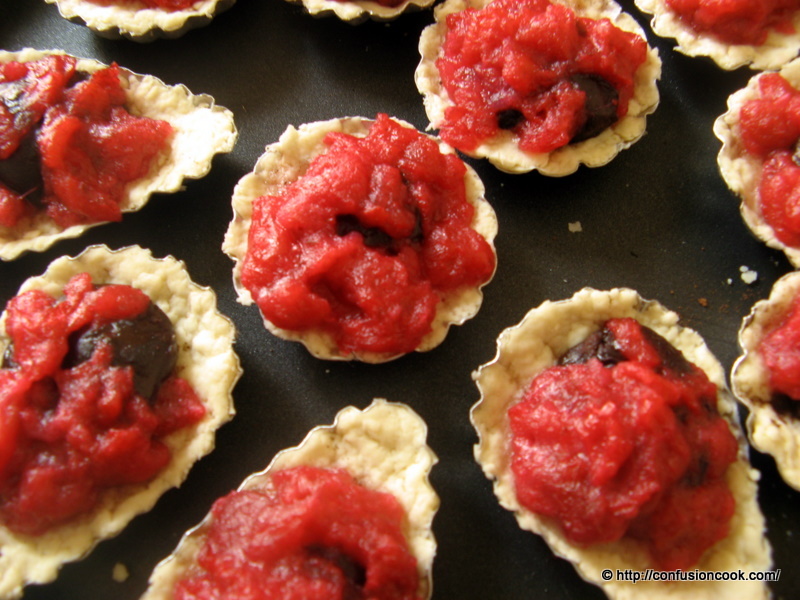 Divide the dough into 12 equal parts & line the tart moulds. 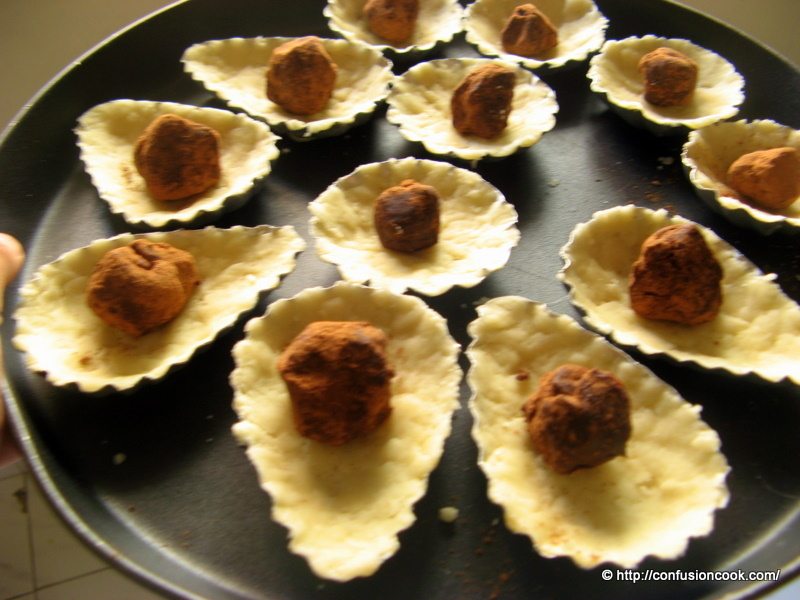 Place one truffle per tart mould. Then top it with 2 tsp of cherry pie filling. Allow to cool completely on wire rack in the moulds. Do not de-mould when hot as you can scald yourself. ‘Only’ – Sweets & Desserts guest hosted by Gayathri of Gayathri’s Cook Spot & started by Pari.